An audience may sit through poor picture quality, but they will rarely tolerate flawed poor sound. It is more than 50 percent of your project. In this post, we’re going to review the basics of on set sound recording. This includes equipment, elements, and proper recording techniques. Everything you need to know about Sound Recording. WHICH IS RIGHT FOR YOUR PROJECT? When it comes to film and video sound, the first thing you need to determine is whether to use a single or double audio recording system. In a single system, audio is captured directly into the camera, and records simultaneously with the image. For a double or dual system, sound is captured independently of the camera and onto a digital audio recorder. The benefit of a single system is that it does not require audio to be synched up in post-production. This is advantageous in news and documentary formats that often require a quick turnaround of material. Double system is ideal if your camera lacks higher-grade audio inputs. But more importantly, a double system delivers stronger audio quality. One of the ways it achieves this is through a higher sampling rate. You see, when an analog signal is converted to digital, the curves of the wave signal have to be split into samples. The number of times a wave is sampled determines how accurately the digital conversion matches the original. The more samples taken per second, the more accurate the digital representation. This process is known as quantization, and is measured in kilohertz (kHz). For example, 11kHz would be low-quality sound, and 48 kHz would be the standard for digital sound recording. Double systems also deliver greater bit depth. This term refers to how many different values of amplitude each sound sample possesses. The higher the bit depth, the more accurate a system can record and reproduce the subtle fluctuations in a waveform. For example, 16 bit audio, which is standard for a digital audio recorder, can capture 65,536 different values of sound. This contributes to the richness and complexity of the sound recording. Perhaps the most apparent benefit of the double system, is that audio does not have to be tethered to the camera. If you have a project that relies heavily on dolly and steadycam shots, you don’t want to risk tripping on excess cables or equipment. This way, you can concentrate on the image, knowing that the sound design will not be jeopardized. Whether you’re using a single or double system, it’s important to identify which configuration is most appropriate for your project. Controllable noise is interference that can be managed. The biggest offenders of this type of noise are refrigerators, mobile phones and personal electronics. Make sure all phones and appliances are switched off. But, especially when it comes to refrigerators, remember to power them back on after production for some very obvious reasons. As the name suggests, uncontrollable noise originates from forces outside of one’s control. This might be a passing car or airplane, or music emanating from a nearby building. This is where professional headphones come into play. If you pick up some of this unwanted interference, make sure to announce it on set. Wait until the sound ceases, or if it doesn’t seem to be wrapping any time soon, move to another location. A big part of good sound design and sound recording will come by way of your experienced sound operator one set. While we mentioned that sound is possibly more than half your project, many productions limit their sound department. Regardless of your philosophy, you want a sound person on set. 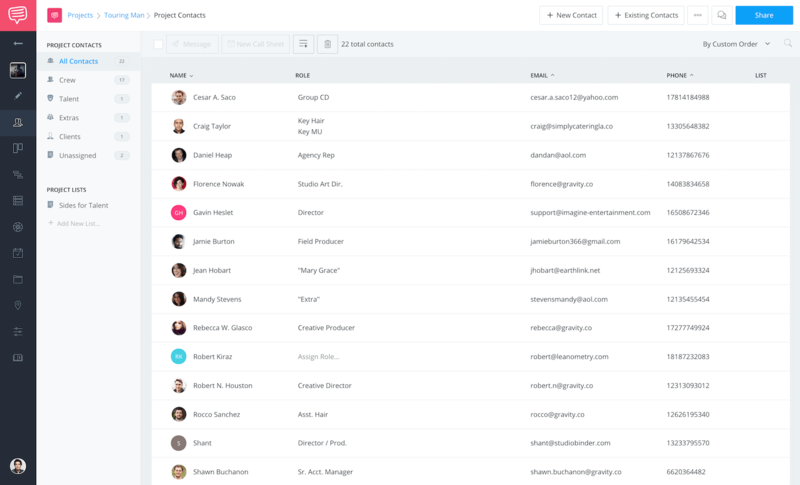 When organizing your cast and crew, you can enter the contact info for sound mixers and boom operators in your contacts management page. This isn't limited to the people you hire either, because you may want to keep a highly organized list of potential sound people ready just in case. Use your contacts management to the full potential, and you can also keep and link deal memos, employment information, kit info, anything you need. Yes, the shotgun microphone. This mic has become the industry standard for recording film and video sound. What’s great about this zeppelin-shaped device is that it can pick up audio without capturing excess environmental noise. Often, the shotgun microphone is mounted to a boom pole where it can be held above or below an actor to capture dialog. Also, windshield accessories such as a “blimp” or the cuddly-sounding “dead cat,” fit snugly over the microphone and reduce distortion. Dynamic microphones are what you picture when you typically think of a microphone. The same that most performers hold when singing. Although a dynamic mic lacks the directional capacity as a shotgun microphone, it is excellent for recording in loud spaces. These mics don’t require external power and lack an internal amplifier. Because of this, they tend to be used during broadcasts or performances. The lavalier microphone, or lav, is an omnidirectional microphone that clips onto the costume of an actor. These tend to be used if an actor is moving around often. However, placement of the mic is key. Because the lavalier microphone lacks the frequency balance of other devices, it can add an unwanted nasal quality to the dialog. Also, the lavalier microphone operates through a wireless system. This of course offers a greater degree of movement, but eats through battery life rather quickly. There’s also the risk of radio interference ruining a take. When the option is available, the security of a wired connection is always preferred in sound recording. As you can imagine, avoiding noise interference is vastly important in sound recording. This is where a preamplifier, or preamp, comes in handy. A preamp is an electronic amplifier that boosts a weak electrical signal into a stronger one. This inevitably makes the signal noise-tolerant and ready for processing into a sound mixer. A microphone, for example, produces a weak electrical signal. Without the assistance of a preamp, the final signal emanating from the device would be noisy and distorted. Now, most preamps have a switch where a user can toggle between line and microphone signal options. These are the sources of where the audio is coming from. A line signal typically comes from the console of a sound mixer or playback device. The audio here tends to be strong, and doesn’t require significant amplification. As mentioned, microphones are far weaker and do require this boost. An important thing to remember though, is that when you boost an audio signal using a preamp, you boost the noise of the preamp itself. This is another strike against the single system as in-camera preamps tend to be noisier than their dual system counterparts. Yes, amplification is important when recording sound. But when using a preamp, you need to be aware of your audio levels and avoid clipping. Clipping occurs when an amplifier is overdriven, and forced to deliver an audio output that is beyond its capacity. Basically, the clipping point is the maximum level of loudness. Keep at least an 18 decibel (dB) difference between ambient noise and your desired signal. Following this simple rule, will ensure you achieve a strong, clean signal when using a preamp. Okay, sure. Audio cables may not be the most exciting topic of conversation, but they’re important when it comes to sound design. Audio cables come in two varieties: balanced and unbalanced. An unbalanced audio cable is the simplest, most cost-effective of cables. These devices possess either a mini jack, phono tip sleeve or an rca connector. Most carry a mono audio signal, but there are stereo varieties. Now, an unbalanced audio cable is comprised of two wires. One wire is a shielding mesh wire known as the ground, which is the zero point for the signal. The other is known as the hot, which is the signal itself. This cable is more susceptible to noise interference, and is typically used to cover shorter distances. For longer distances, the balanced audio cable is the ideal solution. Using either an XLR connection or a tip ring sleeve (TRS), these cables possess three wires instead of two. As with the unbalanced cable, there exists a shielding mesh ground wire and a hot wire. But instead of sending audio down a single wire, it is now being transferred down two wires. Along with the hot wire, there is now a cold wire. When an audio signal reaches the end of one wire, it reverses itself and travels down the other. This process cancels out any external noise or interference that might affect the sound recording. Because of this, the balanced audio cable can take a lot of strain on set without sacrificing audio quality. As with all of this sound recording equipment, it’s about determining what is going to benefit your movie the most. Well, the same holds true for sound capture. In preparing for a production, the sound team should gather and test their gear. This process includes testing batteries and making sure hard drives or tapes contain enough storage space. Also, it’s important to make sure that there’s no controllable ambient sound that could cause interference. The sound team might also record what is known as a buzz track. A buzz track is a track of silence captured on location that can be used in editing later to cover up any unwanted noise. Okay, with the preparations taken care of, it’s time for the shoot. At the start of each take, the first AD will say, “Roll sound.” The sound technician will then press the record button on their digital audio recorder. This process will repeat throughout the shoot. After each take, the sound team will complete a sound report sheet. The document tells the editor what is recorded on each tape, track or hard drive. As expected, communication is key on a film set. And nowhere is it more important than in connection with the sound recording process. During on set rehearsals, the sound team will discuss and determine the appropriate recording levels, as well as microphone and actor placement. For example, if dialog is too quiet, the background noise will overpower it once the audio is compressed. The point of course is to create an environment where sound capture will be clean, and without drop off. With sound capture being a vital component to the moviemaking process, it’s imperative that the sound team makes the rest of the production aware of any issues that may arise during recording. You will be able to hear things they cannot, so don’t assume they’re aware of every issue. Fair or not, they will hold you responsible later. This includes ambient noise interference or quiet dialog. You may think well, what’s the big deal? We can just fix it in post production anyways. Yes, perhaps. But, it’s always a better idea to get the desired sound recording on set, rather than waiting weeks, or months to re-record it. Remember, if sound design is your business, you should have no problem voicing your concern and adding production value for $0.00. Not surprisingly, microphone distance can make or break a sound recording, and may lead to you being rehired or passed up. Whether you’re using a shotgun or a dynamic microphone, make sure the device is no further than three feet (1 meter) away from the subject. Remember, closer is always better when building strong sound design. Yes, this may seem like a simple, obvious tip. But, following this rule will dramatically strengthen your audio quality. Shooting locations can be unpredictable, especially when it comes to sound recording. One of the most common, and unfortunate side-effects of an indoor location is bouncy sound. To combat this, sound teams have developed a number of practical solutions. Adding soft textile items such as rugs, curtains or acoustic paneling to walls helps to deplete echoes. Every member of the sound team, from the sound mixer to the recorder, needs to possess a professional pair of headphones. When setting up a location, listen carefully to the space. Then, make a careful determination of whether additional items are required to reduce echo. Now you know about production sound, but don’t stop your education there, because great filmmakers are as much crafts people as they are artists - possibly even more so. Check out our Essential Filmmaking Techniques for Directors & Writers where you can learn all about some of the most crucial elements to filmmaking in the professional world of filmmaking.